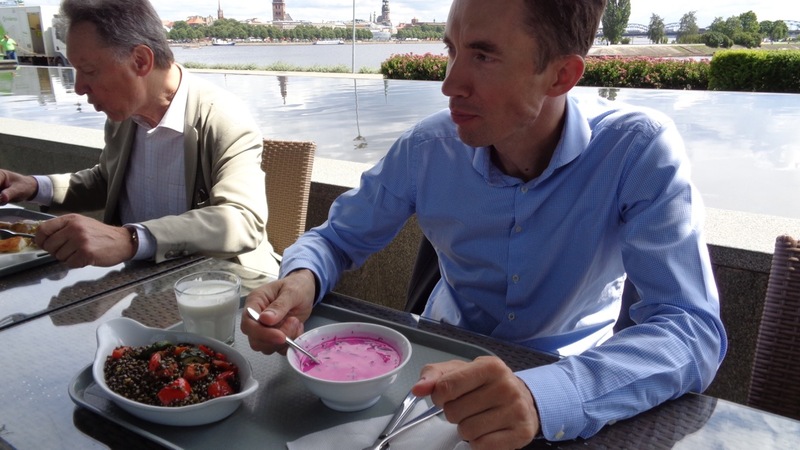 Bruno and Ansis at Swedbank with some kind of pink soup. On the way back from the airport, Ansis took us to lunch at the new Swedbank building on the banks of the Daugava River in Riga. 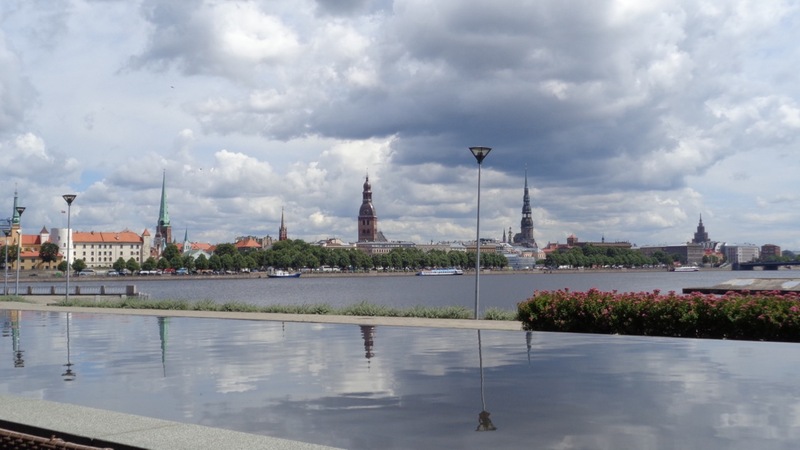 We sat and had lunch with a beautiful view of Old Town Latvia. After we got to the apartment, unpacked, and settled in, we decided to meet Gita, Vitauts’ great-niece somewhere. We agreed upon the Hotel Riga, a fitting stop, at 6 p.m. since she had to finish her day of work. Bruno, Ansis’ father and my cousin (long story) agreed to drive us, but he didn’t want to park and stay because parking is a hassle at rush hour in Riga. After he drove the few blocks to the hotel, I didn’t blame him. He told us to call him when we needed a ride back. What a trooper! Gita was there waiting. 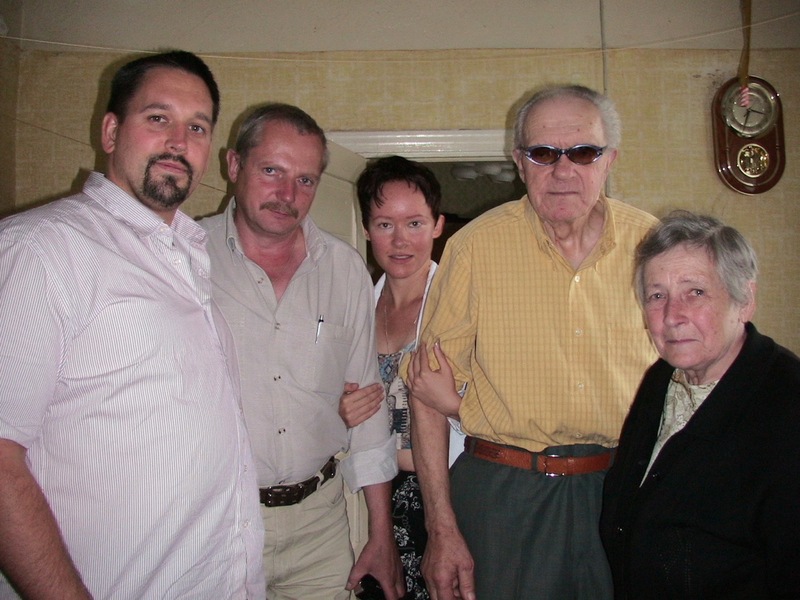 I had met Gita in 2005 when I visited Latvia and saw my Aunt Austra in the tiny village of Meri. Gita was still a student, and now she is a full time editor at the University of Latvia press (if I understood her correctly). She speaks excellent English, but constantly apologizes. She was very friendly and carefully corrected some of Vitauts’ missing memories. 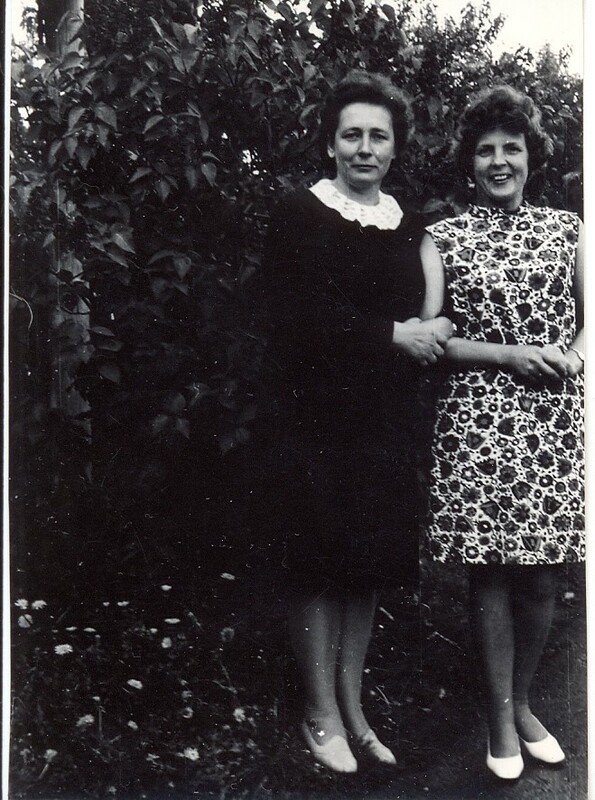 Dad had a friend named Helma back when he lived in Smiltene. She was the adopted daughter of the schoolmaster in town. Dad stayed with them during the winter so he wouldn’t have to try to get back and forth from the farm. When Gita told Helma that Vitauts was coming to Latvia, she basically said that she would stay alive to see Vitauts one last time. Vitauts fondly remembers Helma, but confuses her story with Gita, so it was kind of a funny moment… especially considering that Gita is only 30 and Helma is 90. We had our first negative experience at the Hotel Riga restaurant. The waiter served us drinks right away, but he never came back to take our order or bring us our check. Gita said that this was normal and that we shouldn’t be offended. 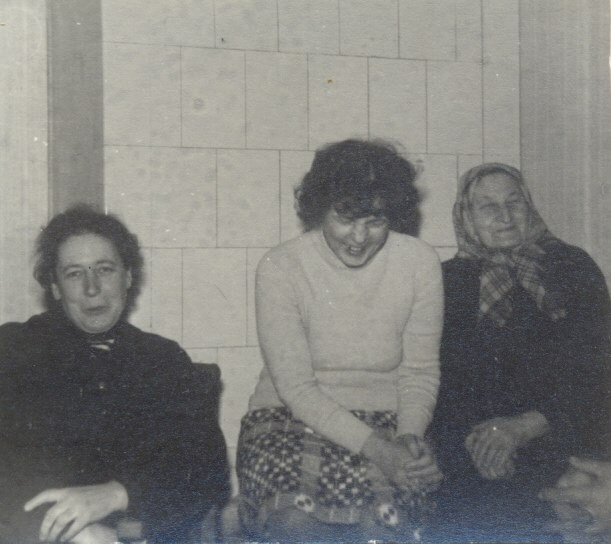 We made plans to pick her up on Wednesday to take a day trip to Smiltene and Cesis to see Vitauts’ family, hugged, and said goodbye. Gita took the bus, dad went home with Bruno and Glen, Susan and I decided to walk home and get a feel for the streets of Riga. 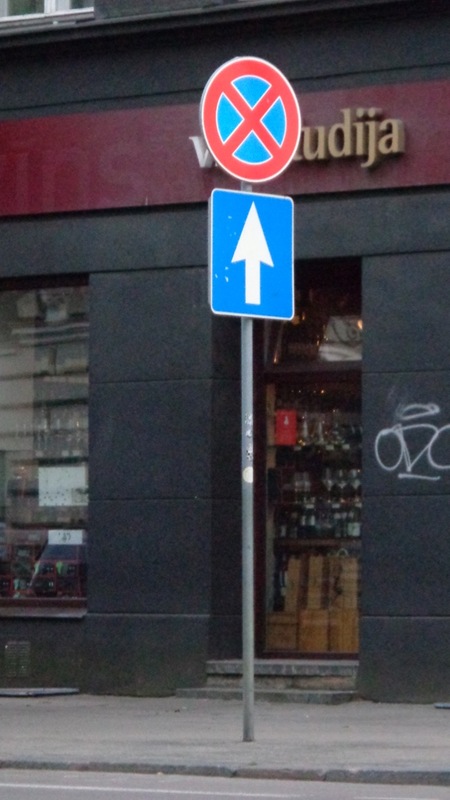 Elisabete Street is a winding avenue that goes right around the Old Town city Center of Riga. Several embassies are right by the flat we are staying in. There are also several nice bars and restaurants. It has a Haymarket/Old Market feel to it. We stopped by a fresh fruit vendor for some delicious cherries, and then decided to eat at the Flying Frog. Most of the restaurants we went to had English and Latvian menus and most of the staff speak pretty good English. They are very accommodating. The Flying Frog had a mix of Latvian and Americanish foods. We decided to have a few appetizers because we weren’t really hungry for a big meal. Little did we know that Latvian appetizers are a meal in and of themselves. This, we found, is a running theme in Latvian culture. “Eat! Eat!” they tell you. After our food and a few drinks, we walked the rest of the way home, and had an interesting encounter with what we believe to have been a drunk Russian. Sue said she had never seen someone so drunk who could still be standing up. When we got back to the apartment, dad was sitting in the chair looking at a blank television. It was a bit sad, but I think he was tired and ready for bed. So were we.